It is a series of transvaginal ultrasounds to monitor the size and number of developing follicles in the ovaries. Follicles are fluid filled structures which contain eggs or oocytes. How many times we need to come to Reviva Clinic for follicular monitoring? In majority of couples, you need to come to clinic only three times for follicular monitoring. Ist ultrasound is done on day 2nd or 3rd day of periods (day 1 is day of onset of menstruation) In this we study the baseline pelvic organs. Uterine lining should be thin and ovaries should be in silent state i.e. no cyst or dominant follicle more than 10 mm is present. If this is your first pelvic ultrasound then it gives us additional knowledge about any uterine pathology like fibroid, adenomyosis or ovarian cyst. We can also rule, out any tubal pathology and ovarian localization. IInd ultrasound is done on day 10 or day 11 of periods. The size and number of developing follicles is noted, Endometrial thickness is also recorded. 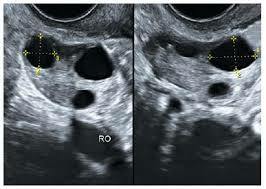 The approximate day of rupture of follicle can be calculated from this ultrasound. IIIrd ultrasound is done on approximate day of rupture to confirm the same. Is follicular monitoring necessary when we are taking medication for infertility? Follicular monitoring is essential to see the response to treatment. Secondly the dose of fertility medication can be adjusted if there is an inadequate response or too many eggs have started to form. It also helps us to pin point the day of rupture so that chances of conception are increased even in natural cycle. What is better way of follicular monitoring transabdominal ultrasound or Transvaginal ultrasound? Transvaginal ultrasound is definitely better than transabdominal ultrasound ones, as the probe is more closer to the pelvic structures and also you need not fill your bladder for hours. What should be ideal size of follicle before rupture? The dominant follicle can be made out by day 8-12 depending upon cycle length. Thereafter it grows 1-2 mm per day and measures approximate 20-24 mm in mean diameter, when LH surge occurs ( before rupture ). There is a large range of follicle size at maturity and the size at which it ruptures.